When a career news anchor's on-air breakdown gets massive ratings, the network exploits it and tries to cash in on his continued unstable mental state. Revisiting a movie like "Network" can really make you think. What once was a satirical indictment of the dangers of sensationalizing the news for entertainment and ratings has now come to fruition. 40 years ago, the idea of a crazy old man raging about the state of the world, espousing wild conspiracy theories sold as truth was unthinkable. Now, it's just another Tuesday. "Network" is directed by Sidney Lumet, who has made such iconic films as "12 Angry Men," "Serpico," and "Dog Day Afternoon." It stars Peter Finch as Howard Beale, a man who has worked as a news anchor for over 20 years. When he learns he is about to be fired, he has a breakdown on air and even threatens to kill himself in an upcoming episode. When his breakdown returns huge ratings for the company, ambitious young programmer Diana Christensen, played by Faye Dunaway, has the idea to give Finch his job back and allow him to freely rant about whatever he wants, turning him into the mad prophet of the airwaves. She turns what was once a well-respected news program into a sensationalized outlet of punditry for the sake of entertainment and ratings. That would never happen in real life.....right? Also in the film are William Holden as the old-school head of the news department, who holds integrity in higher regard than profits, Robert Duvall as Frank Hackett, the eventual head of the network who only cares about money and ratings, and Ned Beatty, who plays the corporate overlord who owns the network and runs things behind the scenes. Sidney Lumet has a knack for making films that remain relevant even decades later. Sure, television is not the powerhouse it once was. No show is getting a 60 share of the audience, but that doesn't change the general ideas of "Network" that have absolutely come to fruition. Cable news shows, the internet, and radio are all loaded with Howard Beale-type people espousing opinion as if it were absolute truth. Sensationalism has overtaken every aspect of what once was news. Cable news shows and talk radio do whatever they can to get ratings. The internet is full of misleading clickbait headlines from websites that only care about how many clicks, views, shares, likes, and retweets they get rather than whether or not their content is actually worthwhile or even accurate. Though it is not a perfect representation of the future of the news and media, the ideas behind it are very poignant. "Network" explores how people aren't all that concerned with learning new information. It shows how they are more worried about having someone vocalize their own frustrations, and instead of seeking out unbiased content, they find a place where their already preconceived notions can be validated through an echo chamber of like-minded people. The fact that it remains so relevant in 2018 makes this movie even more riveting today. We are drawn in by the sharp, satirical, darkly humorous truths espoused here. The acting is fantastic from everyone involved, in particular, William Holden and Peter Finch. 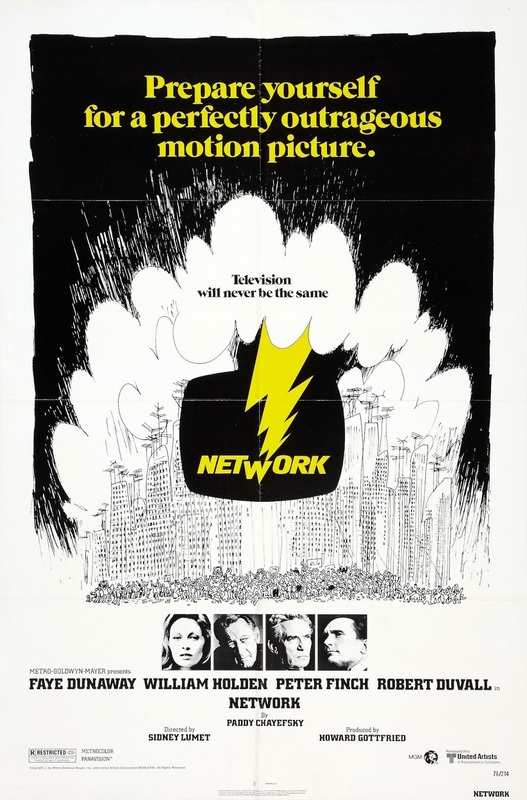 "Network" received nine Academy Award nominations and took home four, including Best Original Screenplay from Paddy Chayefsky, Best Supporting Actress for Beatrice Straight, Best Actress for Faye Dunaway, and Best Actor for Peter Finch, who actually beat out William Holden as they were nominated in the same category. There is no time like the present to watch a movie like "Network." Its relevance astounds us. If you haven't already seen it, you must do so immediately.